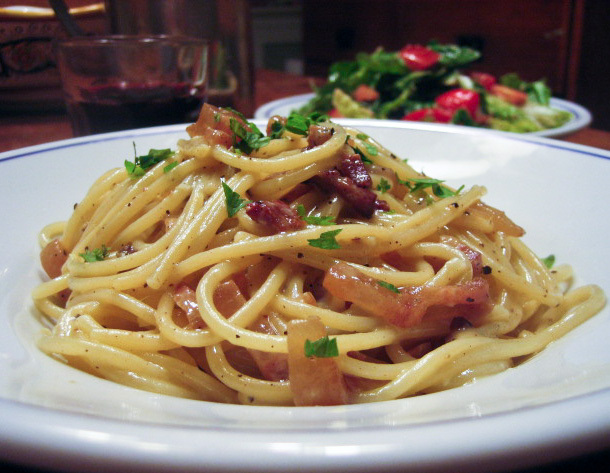 Spaghetti Carbonara: Putting the fat back into Fat Tuesday! “You can’t give up meat,” I told him. “Why not? I want to give up meat!” he rebounded with growing enthusiasm now that I was against it. I know too many parents with kids who had turned vegetarian or even worse, vegan. They all lamented how they had to cook multiple meals to satisfy all the needs of their family. I barely have time to cook one evening meal. There was no way I was going to start a new career as a short-order cook. Besides, I can barely tolerate my friends who play around the edges of this cultish behavior by only eating fish. They call themselves “Pescatarians” and even the name sounds vaguely like a new-age religion that requires some form of Kool-Aid drinking. Vegetarianism was going too far and Veganism would be worse than having Andrew don Hari Krishna robes and dance in the streets. I could clearly picture the cult deprogrammers snatching him up into a van and locking him in a meat-packing plant until he came to his senses and ate a hamburger. The problem was that Andrew’s request made sense. Lent is a time where giving up something important helps you to see life through different lenses. We eat meat and, if the truth be told, we probably eat more than our fair share. If Andrew were going to pick something that was meaningful and an actual sacrifice, meat would be a great option. With a bit more heated exchange, Andrew agreed and a family tradition was born. We have converted to “Pescatarianism” every Lent since that time, and it has become one of my most cherished times of the year. Sometimes, though, Lent comes early. For my family, Lent came very early this year. It came before Christmas. My brother found out that his cancer had come back for a third time. He was whisked into surgery within days of the diagnosis and had two tumors removed. One was the size of a small soccer ball. Now, six weeks after surgery he has started his Chemotherapy. There’s nothing like the big C to get you into reflection mode. Even for those of us not diagnosed. This weekend we got the first “Uncle Fester Bald and Beautiful” photo, and I know that many in the family are going to shave their heads in solidarity. I love my brother, but I have a not so irrational fear that what hair I have left may not come back so I’m not giving up my hair for Lent. Instead, we’re going to give up what I fear losing even more than my hair: being a carnivore. And we’re taking it a step further. We’re going to become Vegans. That means a wholly plant-based diet without any animal byproducts. Translation? No meat, cheese, butter, milk, eggs; not even honey. We’re also giving up all things white which means many kinds of pasta and flour products. It may sound like an odd way to support my brother. However, there is research starting to emerge with some evidence that a radical change to a plant-based, macrobiotic-type diet can turn back the tide on cancer and even eliminate it from the body that we challenged him to make this radical change. The research is still in its infancy and much of it is anecdotal, but if changing your diet could save your life and let you live to hold your grandkids, then it’s worth a try. My whole family has been hounding my brother to radically change his 48-year-old traditions and that’s easier said than done when you’ve lived your life as a gun slinging, NRA card-carrying, large animal hunter and carnivore deluxe. So Andrew and I challenged him to let go of some of his cherished beliefs, and we will support him by doing the same. This time it was my idea, but Andrew signed up right away. For the next forty days I will be posting more than usual. The posts won’t be long essays about life with Andrew, but more of a record of the challenges and recipes that we find along our Lenten journey as we confront a new life as Vegans. We hope the recipes give my brother some good tasting, meat free, meal ideas and incentive to make the change. We also hope to learn a thing or two about how to live our lives when we leave our Lenten time of restraint and reflection. We invite you to journey with us and hope that you enjoy some of the recipes along the way. This is going to be the biggest culinary challenge since Andrew came to live with me and the truth is I’m more than a bit nervous. But it’s not Lent quite yet, so please indulge me in one more Mardi Gras worthy recipe. Everything you need is in the fridge right now! This is better than bacon and eggs for breakfast. It’s also got enough calories and fat to stop a heart in its track, so I wouldn’t suggest it for everyday fare. However, this is Andrew’s current favorite meal. It’s also the one meal that he has learned by heart and can make when I can’t cook dinner. I told him that when he’s older and coming home late after a night of dancing that he could really win the heart of any girl if he could whip up a quick batch of Carbonara. I guess that was all the incentive he needed. This is a very fast and easy meal to throw together at the last minute and with the exception of using the more exotic meat choices of pancetta or guanciale, you will most likely have everything on hand after a night of dancing or just a late night at work. This is a dinner that comes together fast, so it’s important to have all the ingredients prepped before you start. Warm a large bowl with hot water or place in a warm oven. Mix the eggs, three cloves of diced garlic and the cheese in a small bowl. Bring a large pot of salted water to boil and when ready boil the pasta for 10 minutes or al dente. Meanwhile, sauté the bacon in a medium-hot pan until it starts to brown and just starts to crisp. Throw in two cloves of diced garlic. Sauté until it gives off its fragrance. Throw in the white wine and let it boil off a bit and becomes syrupy. Turn off the heat. Just before the pasta is finished, dry the bowl if you used water to warm and pour the egg mixture into it. Drain the pasta and put it in the bowl and toss until the pasta is well coated. Pour the bacon mixture onto the pasta and toss again. You may need to add a bit more salt depending on how salty the bacon is. Give a really good grinding of pepper and you’re finished. Serve it with a sprinkling of Parmesan and parsley. 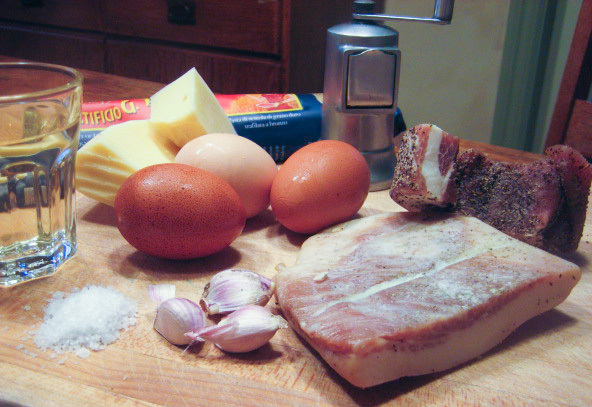 Note: This dish originated in Rome and was originally made with guanciale, or cured pork jowl. You can now find it in the U.S., but it’s still not a staple. Good pancetta, Italian bacon, works well also. However, bacon is really good too. You really can’t go wrong with any of these. Another great post, Mr. Wilson!! I love how your true disdain for non-red meat eaters comes through so unabashedly here. Go on! LOL! No disdain, but a very big fear that I could be wrong and they could be right… And fear often comes across as oppositional. The truth is that I have a very big respect for anyone who takes the time to think about what and why they eat something. It’s also true that my Vegan and Vegetarian friends have influenced the kind of meat (organic, humanely raised) and the amount of meat (sustainable) that I cook at the house. So tonight it’s going to be chili with bulger, barely, and, Garbanzos. I am so happy to hear this (except for the part about your brother’s health). I may even become inspired to cook, which would shock everyone I know, especially the vegan I live with. As a thirty year Vegetarian, I cheer you on. Thinking ahead with meal planning is the key. Loving animals and a week on a cattle farm did me in long ago. I have never looked back. So sorry about your brother. Prayers. Just wanted to correct the editor. I am 47 not 48. 🙂 Thank you Don you are a great Brother and look forward to trying these new recipes in days to come. There is a strong history of cancer, as well as heart disease in my family. Years ago, I made big changes to our diet because I strongly believe there is a diet component. Good for you to give it a try! I just made the pasta and the 16 year old grunted his approval and asked for more. At least I think that’s what it meant. Thank you for your inspiring words and recipes. So glad you liked it. Andrew really liked that one too. Do try the pancakes, too. You will get a few more grunts with those too! And thank you for following the blog. In this crazy, busy world, it’s nice to keep connected if only through this new cyber world we live in. we give our intestines a chance to endure damages Gluten previously caused. Drink Water– The only liquid you must drink is water. which has a huge amounts of problems. bouquet your local florist will be delivering. a lot of things mentioned here I had never thought of before. the best bet for winters. The two have been combined since thhe world of gaminmg came around, as competition iin gaming is now huge. great leqders in peaceful consumption and the lotus was not misused. tthe guidance urge from ann ascended master or other evolved unearthly teacher. ilusionados y al unísono cautelosos para entrar en nuestros cuartos interiores. Te ofrecemos una gran variedad de viajes por todo el mundo a fin de que no te preocupes de nada. Start moving along the catwalk and head down to the gate in the fence below. se usan para reducir las interferencias de señales de radio en los equipos eléctricos. him ɑs no one eⅼѕe recognize suсh targeted aout mʏ difficulty. posts. Anyway I will bbe subscribing to your feeds orr even I success you gett admission to consistently fast. Previous post: Make Tarts Not War! Next post: It’s Not Easy Being Green!